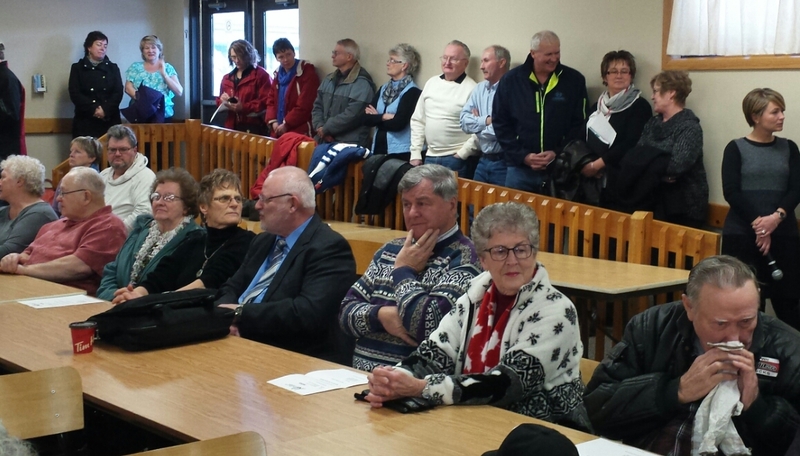 There was standing room only in Elmwood last Friday as residents rallied to save the Restorative Care Unit at the Chesley hospital. Michael Barrett has a problem. The CEO of the South West Local Health Integration Network (SW LHIN) now has the ball in his court as local support has been building to save the restorative care unit at the Chesley Hospital, one of four small sites that make up the South Grey Bruce Health Centre (SGBHC). Barrett’s LHIN initially funded the 10-bed unit on a trial basis three years ago. The problem is the LHIN had no plan in place should the trial turn out to be a runaway success. There was no funding for year two or beyond. That would be the hospital’s problem. This may not be as odd as it sounds. The LHINs frequently incubate new projects through one-time funding. Some don’t pan out. Others do. In normal circumstances, new money is often found to keep the successful high-performing programs going, but these are far from normal times. The restorative care unit at Chesley was successful and everybody knew it. When the hospital announced it didn’t have $800,000 to keep the program running past the end of April, the community quickly rallied. The media were filled with testimonies of how the lives of patients were turned around with a few weeks of restorative care at the hospital. In theory such restorative care was supposed to be alternatively provided by the Community Care Access Centre, but there was much skepticism that it could provide the same level of care. At a standing-room only meeting in Elmwood last week, what the Owen Sound Sun Times calls “graduates” of the program argued that the investment in restorative care actually saves the province money. Chesley resident Andrea White said she was not only back to full living after her three-weeks in the unit, but was now caring for a friend who suffered from a stroke. “Think of the savings being realized to our health care system by having both of us in our homes instead of in long-term care,” she told the Sun-Times. Back when the LHIN initially supported this program hospital base funding was undergoing the first freeze since the Harris government wielded power at Queen’s Park. The question is, did Barrett and the LHIN board understand that funding would be severely restrained for the foreseeable future? Three years later some hospitals have done slightly better than zero, some slightly worse as the province decided a period of deep austerity would also be a great time to carry out a complex new funding formula. Small hospitals were supposed to be exempt from that formula, but not SGBHC. SGBHC CEO Paul Rosebush argued that his four small hospitals were being penalized for sharing a single corporate entity. That appeal appears to have been successful. As a result, the hospital has been receiving funding increases of about 1 per cent per year – still far less than what they need to stand still, but better than zero. After inflation, the province still expects Rosebush to support new programs like the restorative care unit with declining real funding. Rosebush told the Sun-Times that SGBHC was not alone – other hospitals were struggling to keep popular services going. “Our number one concern is the lack of base funding to accomplish what we need to do,” he told the newspaper. That may sound obvious given the circumstances, but brave in a province where CEOs are far more guarded with their criticism. The pretense that this work would suddenly be relocated to a community-based provider appears to have been abandoned. The citizens in Grey Bruce are not easily placated with such rhetoric. Rosebush has set the price. On a $50 billion health budget $800,000 is not likely to rock the finances at Queen’s Park. The pressure is now on Barrett to deliver. 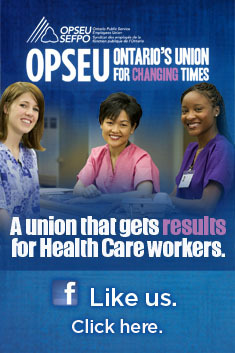 If he succeeds, the LHIN will be seen as having listened to the community and responded to their needs. If he fails he’ll likely take the fall for policies that are coming straight out of the Ministry of Health. The worry is a compromise that may save the unit, but at a price that may compromise other services delivered by the hospital. Ultimately an effective health system is one that remains flexible enough to recognize a sure thing when it sees one. We’re betting on Rosebush and Barrett to pull this one off without simply transferring the shortfall to another critical service provided by the hospital. This entry was posted in Uncategorized and tagged Chesley Hospital, Michael Barrett, Paul Rosebush, South Grey Bruce Health Centre, South West LHIN. Bookmark the permalink.